There seems to be a particular aura about American life in the 1940’s that’s ripe for nostalgia. While we were engaged in the biggest, most devastating war in history, we ascribe a certain romantic, optimistic idealism to the period. We continue to celebrate the decade– especially within Los Angeles in particular, which came of age during the time and was fundamentally shaped by its cultural values and styles. Even as I write this, I will be going to a 1940’s-themed song and dance show in downtown tonight, where my wife dances for a troupe that specializes in songs and styles from the era. The midcentury design and lifestyle aesthetic is an inescapable part of Los Angeles daily life, even today. The 1940’s appears to have also had quite the profound effect on members of the Film Brat generation of filmmakers. 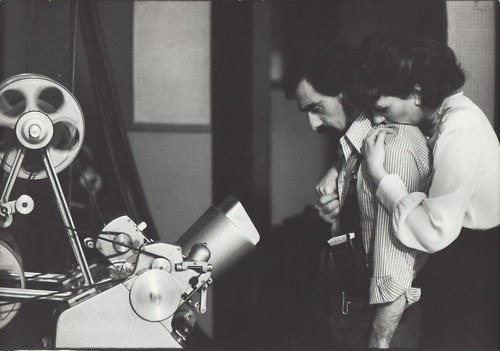 Steven Spielberg is the most visible example, with a substantial majority of his works either taking place in or directly influenced by the 1940’s. To a lesser extent, Francis Ford Coppola and George Lucas also took artistic cues from the period, with Coppola making THE COTTON CLUB in 1984 and Lucas drawing inspiration for INDIANA JONES and STAR WARS from the serialized format popular during the era. In the late 1970’s, rising young director Martin Scorsese was coming off the runaway success of TAXI DRIVER (1976), and found himself in a position of power. For his follow-up, Scorsese desired to make a film that harkened back to the era of 1940’s MGM musicals that he had adored and grown up with. But as a battle-tested acolyte of the French New Wave, Scorsese could not simply make a straight musical—he saw the idea as an opportunity to experiment with the boundaries of the genre and subvert its lavish production values. Working with screenwriters Earl Mac Rauch and Mardik Martin, Scorsese developed NEW YORK, NEW YORK– an oversized musical about the city he called home and the artists that inhabited it. It was the biggest film of his career to date, and when it was released in 1977, it would also become his first high profile failure. NEW YORK, NEW YORK begins in, where else, New York City on a momentous day: VJ Day, 1945. The end of World War II. A young, brash jazz saxophonist named Jimmy Doyle (Robert De Niro) shows up at a big USO celebration gala, where he proceeds to use the same pickup lines on every attractive girl in the room. He eventually winds up at the table of Francine Evans (Liza Minnelli), a pretty young singer sitting alone. Her witty rejection of his lame lines only emboldens him, and from that point on, he dedicates himself to winning her heart. While he aggressively woos her, Jimmy tries to find a regular performing gig, but his tendency to improvise outside the lines of the sheet music grates on the ears of his potential bookers. In a twist of fate, Jimmy and Francine are booked on a cross-country tour, boosting each other’s careers significantly. While on the road, they fall in love and are quickly and quietly married. As a gifted singer, it’s only a matter of time until Francine’s star starts to rise faster than Jimmy’s. Envious of her success, he leaves Francine at a critical juncture—the birth of their son. NEW YORK, NEW YORK may be presented in a happy-go-lucky visual style, but it tells a very modern, complicated story about love’s waxes and wanes over the course of several years, as well as the explosive chemistry that can result from mismatched artistic styles. Despite the lavish production values and large groups of bodies constantly moving through the frame, NEW YORK, NEW YORK really is an intimate examination of two people. De Niro’s third collaboration with Scorsese results in yet another bold protagonist—a womanizer and self-interested man whose very ambition will doom him to a life of loneliness if he can’t change. Like just like had driven a taxi cab for twelve hours a day while preparing for TAXI DRIVER, De Niro prepared for his character here by not just learning how to play the saxophone, but mastering it to the point where it feels like he’s played all his life. Every time I see Liza Minnelli on screen, I only see Lucille 2 from ARRESTED DEVELOPMENT, but her performance here as Francine Evans positioned her as a glamorous starlet following in her mother, Judy Garland’s, footsteps. She’s a natural fit for the role, bringing a strength and grace that’s slightly off-kilter in her signature Minnelli way. Barry Primus, who previously appeared for Scorsese in BOXCAR BERTHA (1972), shows up in NEW YORK, NEW YORK as Paul Wilson, a pianist in Jimmy Doyle’s band and a wedge that comes between the two lovers. Scorsese intended for NEW YORK, NEW YORK to be a break from the gritty realism that had made his name, and to that extent, the film is quite successful. In a bid to achieve the old-fashioned grandeur and slickness of MGM musicals, Scorsese turned to venerable cinematographer Laszlo Kovacs to lens his film. Shooting on the real MGM soundstages in LA, Scorsese used all the studio resources at his disposal to create a sweeping, operatic film quite unlike the gritty immediacy that marked his earlier work. Like the polished Hollywood musicals of old, Scorsese paints in the broad strokes of sweeping dolly and crane movements, framing his subjects in wider compositions while abstaining from close-ups as much as possible in a bid to emulate the stylistic conceits of the genre. The central relationship between De Niro and Minnelli plays off the dynamic between structure and improvisation—Francine’s composed, controlled singing and Jimmy’s off-the-cuff rebellion against sheet music. Naturally, this dynamic is reflected in the actual look of the film, which juxtaposes realistic, Cassavetes style method improv acting against the palpable artifice of studio sets and theatrical lighting schemes. Scorsese and his Production Designer Boris Leven never try to hide the fake facades and sets, opting instead to embrace the artifice as a means to evoke our collective romantic memory of old New York. Stanley Kubrick used this same approach, albeit to a more realistic degree, in the New York street sets for 1999’s EYES WIDE SHUT. Naturally, music is a key focal point in the musical genre, and NEW YORK, NEW YORK is perhaps strongest in this area. Written by John Kander and Fred Ebb, the film’s music perfectly captures the jazzy, big band sound of the era. Even if you’ve never seen the film, you know its music—the “Theme For New York, New York” came into existence because of this film, and it would go on to become an iconic theme song for the city itself when Frank Sinatra covered it in 1980. The song has gone on to outshine the film from which it sprang, and serves as perhaps NEW YORK, NEW YORK’s biggest contribution to pop culture. Though NEW YORK, NEW YORK might be a huge stylistic departure for Scorsese, his unique worldview bears an unmistakable imprint on the film itself. The New York City setting falls in line with Scorsese’s career-long examination of the city’s history and people. The film’s naturalistic approach to drama and conflict also results in outbursts of violence that are rendered in the chaotic, messy way that Scorsese is known for. The subversion of musical genre tropes is also indicative of Scorsese’s habit of filtering classical filmmaking techniques through the lens of postmodernism as a way to comment on the art form itself while finding new forms of visual expression at the same time. The 1970’s were a triumphant era for personal filmmaking and experimentation. It was a perfect confluence of factors that gave rise to filmmakers with anti-establishment sensibilities like Scorsese and turned them into household names. NEW YORK, NEW YORK is very much in line with this string of challenging, personal works, but it may have come too late to the party. Only a week prior, Scorsese’s contemporary George Lucas released STAR WARS to unprecedented success. The audience changed nearly overnight, effectively killing the market for smaller, unconventional films like NEW YORK, NEW YORK. The box office and critical failure of the film reportedly drove Scorsese to depression and drugs, but reports from the set suggested that his downward spiral was already in motion—his insistence that the actors improvise their lines led to a lack of control on his part, and a rapidly worsening cocaine addiction wasn’t doing anything to help matters. The disappointment over NEW YORK, NEW YORK’s reception would cause Scorsese to embark on something of a hiatus from narrative filmmaking for the rest of the decade. The newly humbled director turned his attention to documentary works while his wounds healed, but the time away would reset his approach while setting the stage for a triumphant return in 1980. NEW YORK, NEW YORK is currently available on high definition Blu Ray via MGM.